U.S. Central Command’s Farsi Facebook page, an attempt to reach Iranians chafing under the yoke of the tyrannical regime, may be sending the wrong message. 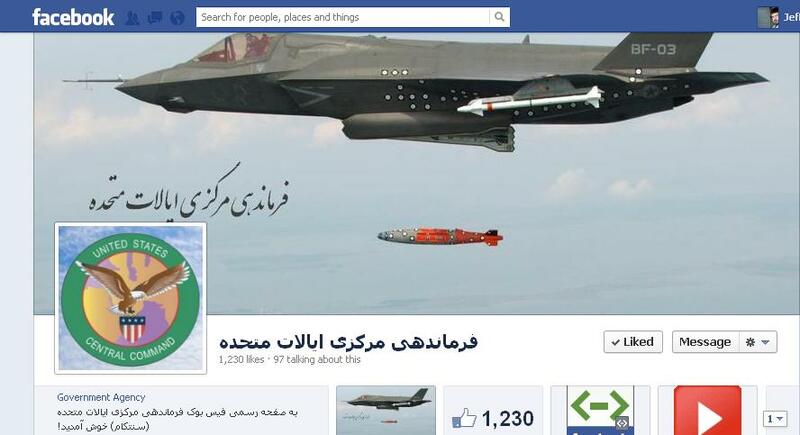 The page’s cover photo shows an F-35 Joint Strike Fighter dropping a bomb with “United States Central Command” written underneath. This comes a day after Defense Secretary Leon Panetta and Joint Chiefs Chairman Gen. Martin Dempsey said Iran is training a militia inside Syria to support another tyrannical regime. And Air Force Secretary Michael Donley recently said that the Massive Ordnance Penetrator – a really big bomb – would be ready if needed. The MOP is designed to penetrate earth and concrete to destroy underground bunkers, like the ones Iran has to protect its nuclear program. A CENTCOM spokesman said the picture is not meant to send a message to the Iranian government. People who visit the page typically like pictures of U.S. military aircraft and personnel. UPDATE: The picture has been removed from the page.